Cook like a pro – Nothing beats cooking outdoors – especially when you’re doing it with the precision temperature control and convenience of a propane gas grill. From a simple portable grills to build-ins, propane offers options for any outdoor space. Keep mosquitos away – A propane mosquito trap will keep away the buzzing, biting pests without harsh smells or zapping sounds. Set the mood – Propane fire pits and fire tables are a stunning way to get an evening in front of the fire at the flick of a switch, with no wood-fire set up or cleanup. 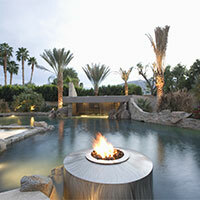 Propane powered lighting can also leave a great impression on your guests. Keep swimming – Why have a big, beautiful pool if no one will go in it once the sun sets, or on a cool morning? A propane pool heater will heat your pool more quickly, effectively, and efficiently than a solar model or electric heat pump – which means people will spend more time swimming and less time on the patio. Make summer last – Propane patio heaters can keep your outdoor space warm well into the fall and remember; they’ll even work when the power goes out! Power your propane equipment and appliances with propane from Q-Dog! Q-Dog makes getting your propane easy and affordable, by providing convenient automatic or will-call options and the safest, most professional delivery techs around.